I'm going to launch my new book of poetry, Our Days in Vaudeville (Mansfield Press), in Cobourg, which is where I live. The book is actually written by me and 29 other Canadian poets. Here I am reading a few poems about Cobourg. I asked Richard Greene, who also lives in Cobourg and who is the 2010 winner of the Governor General's Award for Poetry, if he wanted to launch his new book with me. His new book is Dante's House (Signal Editions). Richard said yes. He and I once went for beers together in Cobourg, which makes him one of my best Cobourg friends! Here's Richard winning the GG. Then I asked local singer-songer Ellen Torrie if she'd like to open the evening with a musical set. Ellen said yes. I've seen her perform a few times around town, and she's amazing. What a voice. Plus she's a teenager, so she brings the average age of performers at the launch down to 41. Here is Ellen Torrie performing. 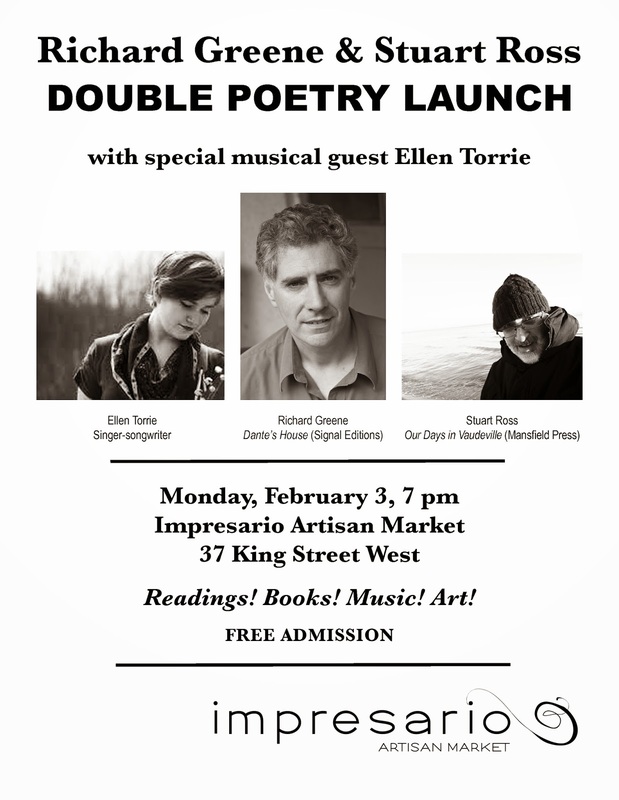 The launch will take place on February 3 at 7 pm at Impresario Artisan Market, at 37 King Street West in Cobourg. Admission is free. Impresario is one of my favourite places in Cobourg — a one-of-a-kind store with a gallery in the back space. Owner Rebecca Baptista is doing amazing things for the arts and literary community here in Cobourg! Here's Rebecca taking the Oath of Allegiance to Poetry. If you are in Peterborough, Brighton, Durham Region, Belleville or Trenton, Cobourg is less than 60 minutes away by car! This is going to be a very fun night. Toronto, Montreal, Ottawa launch tour!